Not to be confused with the smasher Tsuji, formerly known as Edge. Melee's Battlefield showing platforms. Edges (grabbable platforms) are denoted with red. Marth grabbing the ledge of Final Destination in Brawl. Link stealing a ledge from Mario in Super Smash Bros. for Wii U. An edge (also known as a ledge, coded internally as cliff) is any part of a stage from which one can grab or tether (not to be confused with a wall grapple). Edges are often found at the ends of a stage's main platform. The edge therefore becomes an important element in the battle between an edge-guarder and a recovering opponent. Some stages can have many edges or none at all; on most tournament legal stages, there is an edge on both ends of the stage (e.g. Final Destination). The majority of edges on hard and semisoft platforms can be grabbed. Some edges cannot be grabbed, and so make recovery from that side of the stage significantly more difficult. Examples of ungrabbable edges include the moving platform of Peach's Castle (in Smash 64 only), the lower sides of Summit, and all Stage Builder blocks aside from the standard one (and even then, only if the edge is at least two blocks above a floor). Generally, soft platforms do not have grabbable edges, the main exception being those on Norfair. 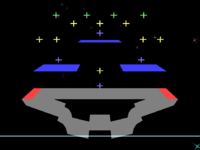 In the original Super Smash Bros. and in Melee, a character cannot grab the edge if facing the opposite direction, with some exceptions, such as when using Falcon Dive and Spinning Kong in Melee. In Brawl and Smash 4, characters can grab an edge behind them, but with a range of 40% less than in front. Characters will automatically grab a nearby edge while in the air unless the player is actively holding down on the control stick or D-pad. Multiple characters cannot hold onto an edge at the same time, with the exception of the Ice Climbers in Brawl and Ultimate where both climbers belonging to one player can grab the same edge. When a character grabs an edge, they will briefly become intangible. This is the basis of ledgestalling (see that article for more detailed analysis of how edge-grabbing works in Melee). However, in Brawl and Smash 4, the intangibility immediately disappears once they let go of the ledge by pressing down on the control stick, preventing characters from having indefinite ledge intangibility. The physics of grabbing edges have undergone a massive overhaul in Super Smash Bros. 4. In this game, air time and damage of a character affect how much intangibility is earned by grabbing the ledge; a healthy character with a high amount of air time earns more intangibility. Damage no longer affects a character's recovery animations, so they always use their fast ones. A character can also be stopped from grabbing a ledge for 55 frames if they are hit, forcing most characters to predictably delay their recovery in order to sweetspot the ledge. Finally and arguably most importantly, attempting to grab an edge that someone else is already grabbing will gently remove them from the edge and then grab it, negating edge-hogging, and grabbing an edge a second time without touching the ground or being hit will not grant intangibility, negating planking. Grabbing and stealing edge while someone hangs from it as well is commonly known as edge trumping. 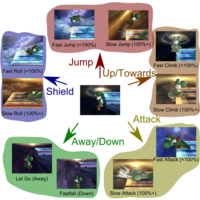 A chart showing different ways for a character to edge recover in Brawl. When a character's damage is lower than 100%, the character is considered "fresh", and is able to climb back onto the stage from the edge rather quickly. However, at percentages of 100% and above, the character can be considered "tired", and climbing becomes a harder task. As a result, all edge actions aside from letting go have two possible animations: one with the character performing the action in a fluent and fast manner, and another with the character doing so in a messy and slow manner. The fast and slow animations are often noticeably different in execution, such as a quick flip kick versus a slow trip kick, or a quick roll versus a slow crawl. The slow actions were removed in Smash 4. The amount of intangibility gained upon grabbing an edge differs between games, but is generally a fixed value. This changes in SSB4, where both air time and percentage have an effect. Players with low damage and low airtime are intangible for 64 frames (~1 second). Players with high damage and high airtime can be intangible for up to 80 frames (~1.333 seconds). As a result, fresh players that grab the edge are about even with highly-damaged players trying to recover. Players with high damage and low airtime are only intangible for 24 frames (0.4 seconds), so it does no good to grab the edge multiple times when recovering. Players with low damage and high airtime can be intangible for up to 124 frames (~2 seconds), much more than any other game. However, this is difficult to achieve, as the required airtime is 5 seconds. The amount of damage a character has affects how long they can hang on an edge before automatically dropping off and beginning to tumble. These durations can only be altered in SSB4 with Lingering Edge and Hasty Edge equipment; nothing else has any effect, such as character properties or item-provided statuses. A two frame punish is a mechanic introduced in Smash 4 that allows a potential edge guarder to attack an opponent attempting to recover without even leaving the stage or hardly coming off. When a character uses their up special, there are two frames (or 1/30th of a second) of tangibility directly before they grab the ledge. The two frames of punish time don't appear if the character recovering grabs the ledge not by coming up, but by going past the ledge and grabbing it on the way back down, or just jumping and not using their up-b, though both can lead to punishment regardless. If the recovering character uses a teleport recovery (like Sheik's Vanish) starting from above the ledge, the two vulnerable frames don't apply and there will be no room for punishment. Tilts and Z-Dropped items are generally the best tactics to make use of the frames. Any attack that goes below the ledge will work, but they're the least punishable. The downward half of Kirby's Final Cutter and Cloud's Climhazzard can act as an extremely powerful meteor smash or sacrificial KO if landed during this period. The edge sweet spot is the range around a fighter from the edge of a platform at which a character can still grab the edge. This is normally in reference to a recovery move such as an up special move, but is also active when a fighter is falling downwards and not using an aerial. This distance varies for each character and each type of recovery move, with some recovery moves having large edge sweet-spots, while others cannot sweetspot at all. In addition, some fighters have notoriously large edge sweet spot hitboxes, particularly in Smash 4, which has led to many players jokingly referring to the feature as "magnet hands". All characters have 2 hitboxes, one in front and one behind them, usually towards their head area, which when overlapping with the ledge will result in the character grabbing the ledge. Some special moves only enable the front edge sweet spot hitbox to be active, while some do not allow either for either part of or the entire duration of the special. Notable recovery moves that cannot edge-sweetspot are Captain Falcon and Ganondorf's up specials in Melee, along with Little Mac's Rising Uppercut and Cloud's Climhazzard (if he is not under Limit Break status). Typically, when attempting a recovery, it is more useful to aim up special moves for the ledge in an attempt to sweetspot the ledge (if possible), rather than recovering to the stage. This page was last edited on January 12, 2019, at 10:55.